Plotting of the French positions. Thirteen pages folio on Anglo-Dutch watermarked Van Gerrevink laid paper, written in ink in a copper-plate scribal hand, signed with the initials "P.M.", dated September 1756, with a postscript similarly initialed and dated 23 December 1757. Ink and colour body washes, manuscript map with keyed references below relating to the map and report. Scale: 400 ft. to an inch. Within a ruled border. Good condition. Mounted within a triple matt (two of museum quality), glazed, giltwood frame. In the spring of 1756 Patrick MacKellar was appointed chief engineer of the British forts of Ontario and Oswego. During August he was engaged in repairing and strengthening the frontier forts (formally Pepperell or Chouagen) on the Oswego River, when, on the night of the 10th. they were surprised and attacked by a French force of 3,000 men. In spite of a heroic defence, the forts eventually surrendered during the afternoon of August 14. Sixteen hundred prisoners, including MacKellar and 79 other officers, were captured. MacKellar was taken to Quebec City as a prisoner of war where he was kept in fairly close restraint. He was able, however to make detailed notes on the city's defences, until some time in September when he was transferred to Montreal. 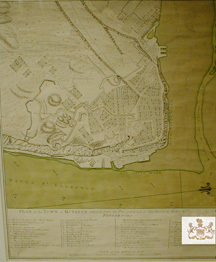 In December of 1757, following a meeting with his fellow prisoner-of-war, Moss, it would appear that MacKellar had time to draw upon his notes in order to compile the above report and arrange the production of the map. On a salary of a pound a day, the now Major and Chief Engineer, MacKellar accompanied General James General Wolfe, Supreme Commander of the British Land Forces in America, to attack Quebec. During the siege of Quebec the intelligence contained in this report proved to be invaluable. Despite being wounded in the attack from Montmorency, MacKellar scaled the heights of Abraham with Wolfe, and took over the command from Wolfe when he fell. Quebec capitulated on September 17. Upon occupation by the British, Mackellar strengthened the defences, thus enabling it to withstand the 1760 French attempt to retake the city. Although MacKellar was severely wounded during the attack at Sillery, he later took part in the capture of Montreal and other engagements, thus completing the fall of France in Canada. Mackellar also contributed much to the survey and defences of Halifax, and various engagements in the West Indies during the expulsion of the French, eventually being promoted Colonel and Director of engineers on Minorca. This very legible 13 page folio report bearing MacKellar's initials was considered of the utmost importance by his commanding officer General James Wolfe and, SHOULD NOW BE CONSIDERED AS A DOCUMENT OF NATIONAL IMPORTANCE TO THE PEOPLE OF CANADA. Using the intelligence contained therein, Wolfe landed his men at Quebec and scaled the heights of Abraham. BACKGROUND OF THE MAP: it is known that more than one manuscript copy was made at the time ( as would be expected as the report was under discussion by Wolfe's General Staff and the Board of Ordnance). Although differing from the copies held in the Public Archives of Canada (P.A.C. ), the significant intelligence amendments contained in our accompanying report were not transferred to the reconnaissance map. THE REPORT & MAP (of which we know of four contemporary copies; P.A.C. & B.M.) is compiled from MacKellar's notes, is written in a similar hand, which in view of MacKellar's rank, was probably scribal, but is remarkably akin to known examples of MacKellar's handwriting held in the Public Archives of Canada. Our copy has a lengthy and highly significant postscript not included in the other copies. The report is dated September 1756. It contains information drawn from Mackellar's experiences whilst a prisoner-of-war in Quebec, from August 1756 and prior to his transfer to Montreal and eventual release in the exchange of prisoners in the spring of the following year, and bears the initials "PM"
THE POSTSCRIPT (dated and initialed 23 December 1757) details six extra points containing important new intelligence. The contents cover significant modifications and reinforcements to the town's defences subsequent to MacKellar's departure which updates the information in the main body of the report, and includes additional topographical information, modifications to the fortifications and a substantial increase in the number of opposing troops, the postscript is clearly dated 23 December 1757. This important intelligence is not contained in any other copy of the report of which we are aware, and follows on from the main body of the report (dated and initialed September 1756). "The greatest heights of the cliffs is a little above and below the redoubt of Cape Diamond, where it must be at least 200 feet high, it falls from thence in several easy breaks..."
"The Low Town on the east side is a fair object for both shot and shells from shipping, the buildings are in general high and pretty close." "There is a break in the cliff westward of the 8 gun battery marked '4' where four or five people may pass abreast, it is pretty steep and may be easily secured." "Battery '4' consists of 57 guns but to the anchoring ground points only 36." "...To the hangman's redoubt 'W' is a small wall of masonry three or four feet thick and seems to have been designed only against small arms..."
"I am persuaded from all the circumstances I could learn that the place must be weak towards the land and the difficulty they made of our seeing it seems to confirm it..."
"...In the passage down the river we met only with two difficulties worth mentioning and they were observed by Charlesvoix and in the chart lately published by Mr. Jefferys." "...An invention the French had discovered for infallibly destroying ships going up the river." "...It will be an advantage to land the troops on the townside of the River which is the North but I am very doubtful whether their landing within proper distance of the place can be cover'd by the shipping..."
"...For these reasons I should think it most advisable to land upon the island itself and make it a rendezvous..."
A leaf from an Antiphonary. THIS MANUSCRIPT IS OVER 550 YEARS OLD. UNIQUE. Double sided antiphonary manuscript from Flanders Northern France. Ca. 1450. A WHIMSICAL CARICATURE, traditionally a portrait of the Scribe, in the initial of his name on the Recto makes this unique piece particularly desirable.Small mediaeval Antiphons, such as this, are rare as they were for private, rather than communal, use. Usually commissioned by a member of the Aristocracy who had taken holy orders. 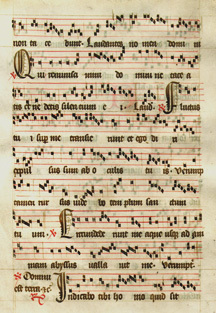 AN ILLUMINATED LETTER 'U' decorates the Verso Gothic textura quadrata script and black letter musical notation in black ink and rubrics and four~line staves in red. Each Versal and Response begins with a four line initial, embellished with delicate tracery works. Anonymous Dutch, first half of 15th Century. Among the most frequently produced manuscripts of the 15th. century were the Book of Hours . Though based primarily on the offices chanted by monks and nuns, the Book of Hours served the spiritual needs of pious lay men & women who frequently commissioned scribes and artists to prepare such prayer and devotional books to their individual tastes, and purse. Highly skilled scribes, themselves mainly monks or nuns, often took painstaking care in producing these, usually small or miniature, books (in order that they might easily be held) in a wide range of style and elegance from the quite plain to the richly illuminated and adorned as in the example of the Hours of Jean, Duc de Berry. UNIQUE. Leaf on vellum, from a manuscript Book of Hours. Scripted & illuminated in original colours on each side of leaf. Double museum quality matted. In excellent condition a most attractive leaf, glinting with the burnish of real gold. 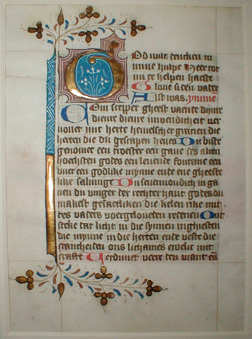 RECTO: 20 lines of manuscript text, 1 five-line capital "G" God in burnished gold and original hand painted colours, 1 two-line initial in painted colour and 6 one-line initials in same. 20 manuscript lines of Dutch text written in black and red ink in Gothic textura quadurata script. Three-sided illuminated border of gold flowers & styalized leaves sprouting from a single bar border (left) of burnished gold & painted colour. VERSO: 20 lines of manuscript text, I two-line capital "H" Heve. in original hand painted colour, 1 one-line initial in same. This is the original carbon incoming signal, known as a ‘Flimsy’ as taken down by the wireless telegrapher W/T Paul Johnson on board heavy Battle cruiser HMS. Dorsetshire, - at 1042 the morning of 27 May 1941. The final engagement to sink the Bismarck having commenced about two hours earlier, and is well documented in the annals of British naval history. The 10 minute difference between the signal being issued from Rear Admiral Wake Walker, Senior Officer 1st. Cruiser Squadron on board the Battlecruiser HMS. Norfolk (Capt. A.J. L. Phillips) and received on the Dorsetshire was normal. The outgoing copy of this signal from the Norfolk is housed in the PRO London. to C & C HF from HMS. Both signals are hand written manuscripts on the standard Naval message pad S1320c. (printed in June 1940.) 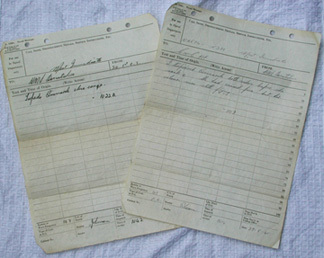 Paper size 11 x 8"
The latter IS THE ORIGINAL OUTGOING SIGNAL from Capt. Benjamin C.S. Martin HMS. Dorsetshire, to Admiral Sir John Tovey Commander-in-Chief Home Fleet received on board the King George V (Capt. W.R. Patterson) as such, it is one of the most significant British naval signals of World War II and most certainly of the Battle of the Atlantic. Interestingly, the hour difference between time of sending & receipt of this outgoing signal is unexplained, unless by events of the moment. Initially the Dorsetshire having acknowledged the execution of its order, proceeded to pick up survivors, until the presence of a U-Boat necessitated departure from the area. Further, the inclusion of the phrase “her colours were still flying” showed that even in time of heavy fighting it was deemed necessary to observe the British protocol of naval warfare. One didn’t fire upon an enemy ship once she had struck her colours. The ‘Pocket’ battle ship Bismarck (Kapitän zur See Ernst Lindemann) with Fleet Commander Admiral Lütjens on board, was the newest warship and the pride of German naval architecture, following the sinking of the pride of the British Royal Navy the Battle cruiser HMS. Hood, the chase to sink the Bismarck covering a million square nautical miles, and the number and strength of the ships deployed against her, is perhaps unique in naval history. Some 64 vessels and 2,878 shells were fired at her, pulverized, she still refused to die. Dorsetshire fired the last 2 projectiles from close range 3000 (3300 yards) starboard side with a hit below the bridge, and another astern, and at 1036 from the closer range 2200 meters (2400 yards) port side, the final torpedo. Bismarck sank three minutes later, whilst also being scuttled. There were 110 survivors and 2090 lost. Regarding a sale of land being two lots at the northwest corner of Spadina and Dundas St. [formerly St. Patrick Street.] for £60. 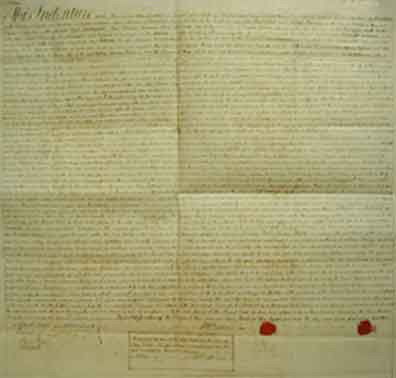 Written in iron gall ink on parchment with accompanying red wax seals and signatures of William Warren Baldwin, Daniel Simmons, parties; Adam Wilson, John Hector, witnesses; and Samuel Smith Ridout, registrar. The value of the property £60, in 1835 translates to an equivalent of £60,360.00 or US $118,925 today, using the per capita GDP. of the day. William Warren Baldwin, Adam Wilson, John Hector, and Samuel Smith Ridout, were all members of the ruling oligarchy generally known as the Family Compact which had tremendous influence in pre-rebellion Upper Canada and particularly the development of Toronto. Daniel Simmons, was listed in the Toronto register alternatively as a Bricklayer or Carpenter between 1835 & 1846.